Total Score: 7.0 + INNOVATION AWARD! Introduction: Tools aren�t new to Berkley, but their past offerings are honestly nothing like their new line of TEC tools when it comes to design and quality. These high-tech and high-utility tools are made for serious anglers. 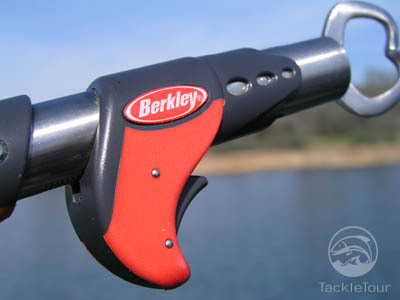 Our first look into Berkley�s new line is their TEC Pistol Trigger Grip fish handling tool which is the first pistol style gripper on the market. Impressions: When I first picked up the TEC Pistol Trigger Grip, my first thoughts were this gripper feels solid and well made. 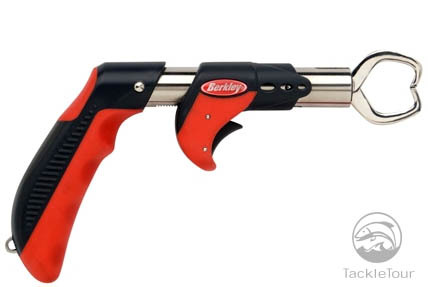 Berkley makes use of a high grade stainless steel for their new gripper and the handle is made from a Softorx� material. When I grasped the pistol handle it felt comfortable in my hand with a good fit and the trigger was within easy reach of my index finger. The TEC Pistol gripper weighs 6.6 ounces with the lanyard attached and is eight inches in length. The pistol handle length is 3.6 inches measured from the inside, and the jaw are 0.8 inches in width from the inside, tip to tip. Included in the package is a nice lanyard to put around your wrist and a quality holster to store the Pistol Trigger Grip when not in use. The holster�s back side incorporates a belt clip that swivels to allow you to push it to an angle when kneeling or sitting to get it out of the way. Field Tests: We only tested the TEC Pistol gripper against largemouth bass but given its size, I feel it can be applied to other freshwater and saltwater species. During our field tests we were able to apply the lipping tool to over fifty fish including some good sized largemouth bass. Convenience: The Berkley TEC Pistol Trigger Grip is very easy to use. 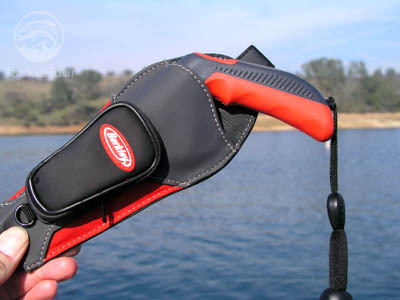 When it�s time to land a fish, you can quickly draw the gripper from the holster and put your index finger on the trigger to unlock and open the jaws. 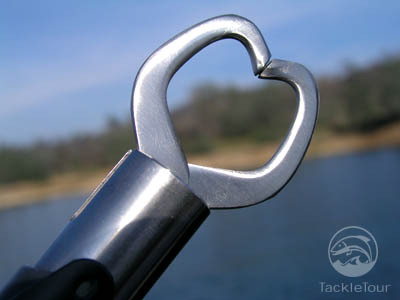 Release the trigger once the jaws are in place and it�ll lock onto the fish�s lip. At this stage the jaws will not open unless the trigger is pressed. Once you have the fish on the Grip you can just hold onto the handle to bring the fish onboard. The TEC Pistol gripper doesn�t come with a swiveling head design which would be nice especially when the fish starts to thrash around or roll while it�s lipped. A rotating design would eliminate any stress placed on the fish or the wrist and make the tool all the more useful and convenient. Another area for improvement or enhancement would be the option of a built in scale. 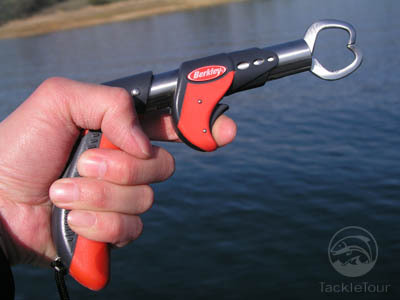 With the TEC Pistol Grip, if you want to get your catch�s weight you need to use another tool. This can be a bit troublesome and time consuming if you�re in a hurry to get your line back in the water. If Berkley designed a scale into the Pistol Trigger Grip that would make it a multi-purpose tool. 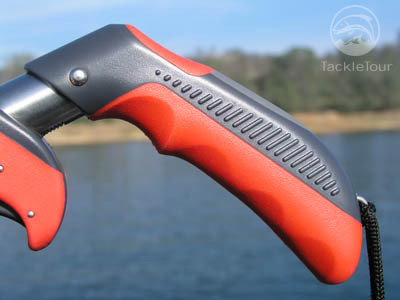 In terms of usage the trigger design is great for rookie anglers. 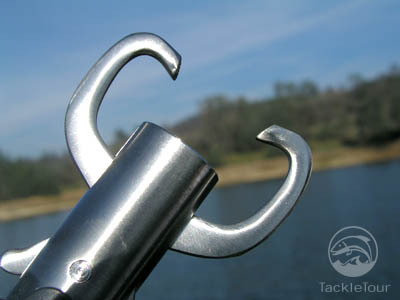 On countless occasions I�ve been caught asking my boat guests to use my Lipper, a tool that requires the user to use two fingers or two hands to open the jaws, and many of them could not figure out how to operate it. The Pistol Trigger design is very straightforward and intuitive allowing anyone picking it up for the first time to use it without much thought.